“Sayre and Jenkins follow Vulture View (2007) with a similarly excellent study of brown bears that’s in equal parts poetic and enlightening.” -Kirkus, starred review. 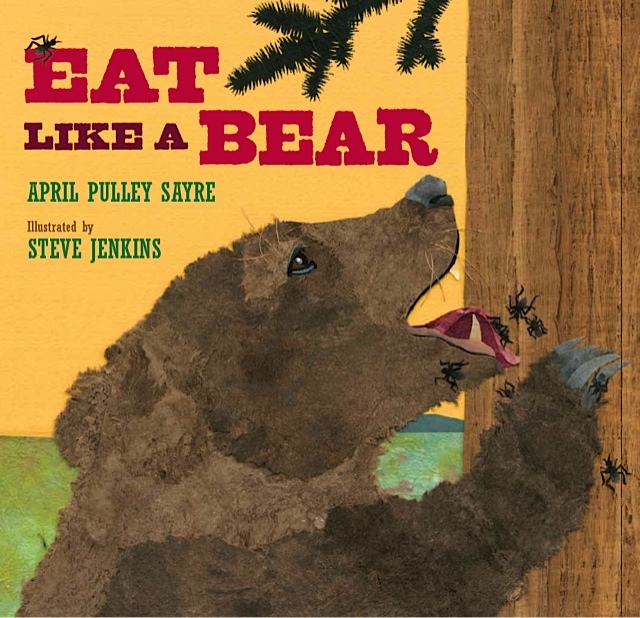 Eat Like a Bear, my book illustrated by Steve Jenkins comes out in late 2012. But I’m already gathering like a bear for winter. The bears in that book are brown bears (grizzlies) but perhaps your classrooms want to study black bears. Here’s a great place to start. My cousin suggested that I might learn from this fellow and it seems he might do presentations in New England so perhaps some schools/organizations might want to work with him. He’s written books and has been featured in television programs. See here. My book Eat LIke a Bear comes out next Fall. It’s a picture book, for young ages, about grizzly bears. But I just read about a curriculum that might interest some educators who want to learn more about bears in order to create related curricula. It’s a STEM based study of bear biology: Curriculum Guide to the Bear Book. Eight lessons in science, math, and problem solving for high school ages. Perhaps it might be used/adapted for some younger students, as well? I have not seen it, but read about it in a NSTA publication. It’s done by Melissa Reynolds-Hogland, exec director of Bear Trust International. I am not very familiar with the various conservation organizations surrounding bear issues, including this one. So if any of you have experiences with the curriculum, and opinions about it that you’d like to share with me, feel free to contact me so I can update this post.